Through June 30, the Jack Mason Museum of West Marin History in Inverness is exhibiting an “historical view” of Inverness Park. Although the Census Bureau and the Postal Service lump the town in with Point Reyes Station, Inverness Park is far older. Much of the area was once owned by Rafael Garcia, who in 1836 was issued a Mexican land grant for three square miles at Bolinas. In 1843, he moved his ranch further north so that his brother-in-law Gregorio Briones could have the land in Bolinas. Mexican authorities subsequently granted Garcia “judicial possession” of his new holdings. However, in 1860, two lawyers from Vermont, Oscar and James Shafter, claimed that 9,000 acres of Garcia’s northern holdings actually belonged to them. They argued that they had acquired adjacent holdings which supposedly included Garcia’s land. The dispute, of course, went to court, and after six years of intense litigation, Garcia’s ownership was finally upheld on Feb. 21, 1866. 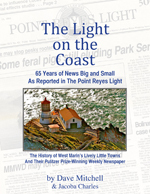 “Whatever joy it gave Rafael Garcia was short lived,” the late historian Jack Mason wrote in his book Point Reyes the Solemn Land. “Within 10 days, the old man was dead, his inquisition over.” He was 74. A water tank at White House Pool collapsed in the 1906 earthquake. Somewhat surprisingly, Garcia descendants had once operated a dairy where the county parking lot for White House Pool is today. There was also a second dairy in Inverness Park. The Lockhart family operated Pinecrest Dairy near the top of Balboa Avenue (where it turns into Drakes Summit Road) until 1961. The dairy, which is across the street from the former St. Eugene’s Hermitage, is now occupied by Doug and Margaret Moore. The dairy barn is still intact but not visible from the road. The center of Inverness Park has always been its grocery stores. This is how the first store, which also sold gasoline, looked after it was remodeled in the 1930s. In 1949, the Alberigi family leased the old store to Annie and Victor Turkan to run while the Turkans built a larger store across the street. This is the cover photo of the Spring 2012 issue of Under the Gables, which is devoted to the Inverness Park exhibit. Here’s what the new store, which would become Perry’s Deli, looked like in its early days. “After the Turkans retired, their daughter Wilma Van Peer — who lived next door in what is now Spirit Matters and had the first television set in Inverness Park — ran it,” Under the Gables notes. “In the 1960s, Vern and Diane Mendenhall bought it from Van Peer and expanded it to include a diner made out of a railway car. Greg (last name unknown for now) bought it from the Mendenhalls and later sold it to Bill and Irene Keener. The Keeners sold it to Dan Thompson over 30 years ago. The old store, which the Turkans closed after their new store opened, became ranchworker housing for the neighboring Giacomini dairy. Eventually, however, it fell into disrepair (as can be seen at right). By then, the federal government owned the site. The National Park Service tore the old building down in 2007 and in 2011 erected a kiosk where it had been. The kiosk (at left), is across Sir Francis Drake Boulevard from Perry’s Deli. It provides information on the Park Service’s efforts to return the Giacomini ranch to wetlands. It also displays minutes of an Inverness Park Association meeting a year ago when the kiosk was discussed. The National Park Service, president Donna Larken noted, had said its work on the kiosk was done although benches (visible above) in the kiosk had not yet been installed. Another bit of Inverness Park history that has also disappeared is the California Trout Farm. It was built in 1910 on Fish Hatchery Creek (next to Portola Avenue) and had a contract to supply the California Department of Fish and Game with trout. Individual fishermen could also come to catch and barbecue their fish. The hatchery closed during the Great Depression but was revived and restocked in 1949. In the foreground are Rose Alberigi and her daughter Edna with an unidentified boy during the early days of the hatchery. The revived trout farm didn’t last long, and its concrete ponds were torn down in the 1950s. “There is part of one pond left, but it may be from an even earlier operation,” Under the Gables explains. The Inverness Park photographic exhibit at the museum was in large part organized by Meg Linden with photos drawn from several collections. The museum is open whenever the Inverness Library, which shares its building, is open: Monday from 9 a.m. to 6:30 p.m., Tuesday 9 a.m. to 6:30 p.m., Wednesday 10 a.m. to 6:30 p.m., Thursday 9 a.m. to 8 p.m., Friday 9 a.m. to 6:30 p.m. and Saturday 9 a.m. to 6:30 p.m. Thanks, Dave, for the delightful recap of Inverness Park and especially the pics. I have had a vacation house in IP since 1981 (burned in the fire and rebuilt) and truly love the Tomales Bay area, one of the most beautiful places on Earth. And thanks for all the years of publishing the Light. I now live in Petaluma but grew up in Inverness. It was a different time in West Marin even in the 60’s. Really appreciate the work you’ve done… way cool! I really love this piece!! One thing that always fascinated me about West Marin, and I regret not exploring more, was its history. Thanks for the great article, sir! Jim Lockhart was my grandfather, and I fondly remember our trips out to the family ranch as a boy. Great to see the history captured in this post, brings back a lot of memories. The Alberigi family sold the original store to a fellow named Ketrin (Not sure of the spelling) who, in turn, sold it to my grandparents, Jimmy and Annie Turkan. My mother, Wilma, did not take over the store when they “retired” but she bought them out when they wanted to “..slow down a bit..” and run the other small grocery they owned in San Anselmo, the Center Market. They lived nearby and continued to run the store for many years. Jimmy continued on for close to 20 years after my grandmother died. Sorry I did not see this years ago. Sparsely Sage and Timely is powered by	WordPress 4.9.10 and delivered to you in 0.543 seconds using 56 queries.